The guest-writers essays series continues with Eve Bailey dedicating her text to an introduction of the work of Ryan and Trevor Oakes. Eve is a French artist living and practicing in New York. Her work investigates the body and its anatomical capacities as it engages in equilibrium with the various mechanical assemblages she creates. She is, however, equally interested in the representational techniques that can be developed in a phenomenological perception of the world. That is in this spirit that she met with the Oakes brothers for the second time in order to write this essay in which she addresses the practice of Frederick Kiesler and his obsession for the notion of endlessness. 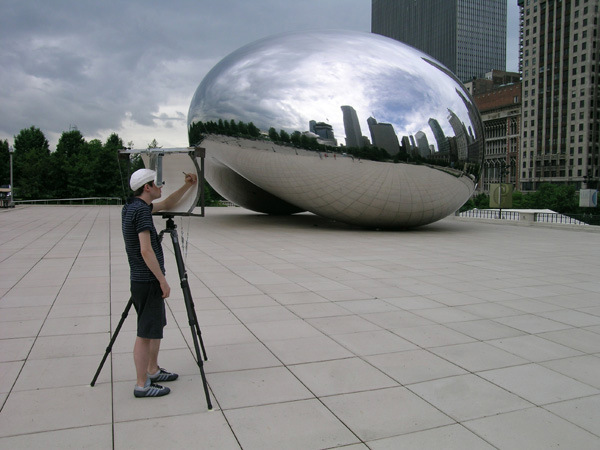 Ryan and Trevor Oakes: Have No Narrow Perspectives [Bean], Chicago Series, 2008. Archival pen on concave cotton paper, 20 x 21 x 10 inches (image 01). Identical twins Ryan and Trevor Oakes have created an innovative method to depict the world before us that constitutes key advancements in the representation of visual reality. Their discovery is the synthesis of reciprocal intuitions, observations and experiments generated by their ongoing dialog about perception – about “seeing with two eyes”. They have been reexamining the knowledge that our experience of the world is binocular and as if we are at the center of a giant perceptual sphere. They came to realize it would be more appropriate to draw on a spherical surface rather than a flat sheet of paper and found a way of tracing the world directly onto curved paper without digital intervention, mathematical calculations or drafting tools. The result is the visual and physical experience of a seamless and organic rendering with no beginning and no end that calls to mind Frederick Kiesler’s original concepts in his project of the Endless House, “endless like the human body”. The fascinating part of Ryan and Trevor’s pioneering system is – as art historian Jonathan Crary articulates it: “they have reintroduced the corporal features of human vision in perspective techniques that had been edited out of our conventional monocular models of representation where the world is presented as if all parts of it are seen with a uniform clarity when in fact the illusion we have of a clear world is obtained by our eyes darting around producing a synthetic image of an overall clarity”. 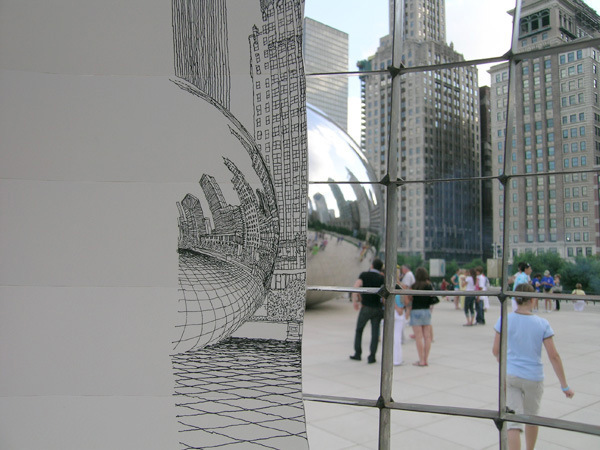 Ryan and Trevor Oakes drawing process with their standing concave easel (image 02). Ryan and trevor Oakes: detail of easel with concave surface and rotatable head stabilizer (image 03). 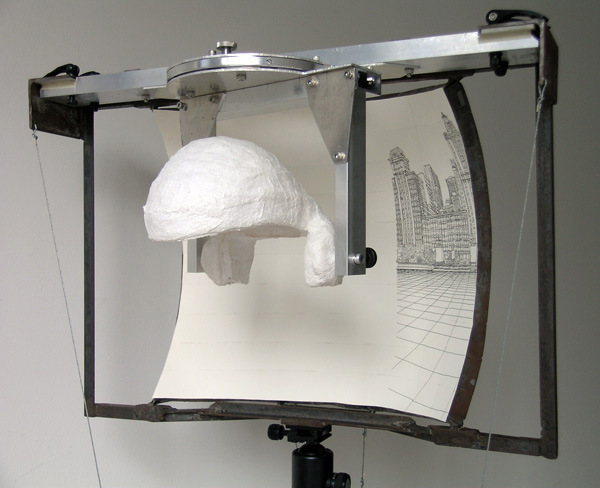 The Oakes designed a spherical easel that can hold a concave piece of paper and added to it a gyroscopic head stabilizer oriented around one of the eyes of the artists in order to keep the vantage point consistent and the head steady for the duration of the drawing (images 02/03). The first easel was built in 2004 and is being constantly altered and improved as Ryan and Trevor refine their binocular tracing principle. 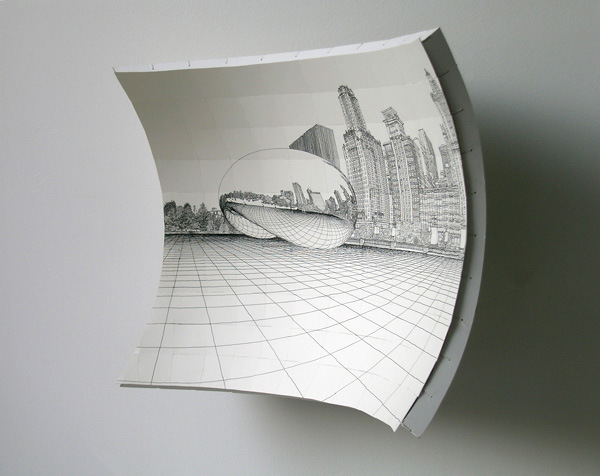 The method consists of focusing both eyes on the objects to be represented in the distance with the paper interrupting the vision’s natural course. Each retina then perceives a separate image of the surface resulting in two distinct images that are not aligned thus creating an optically transparent double image. 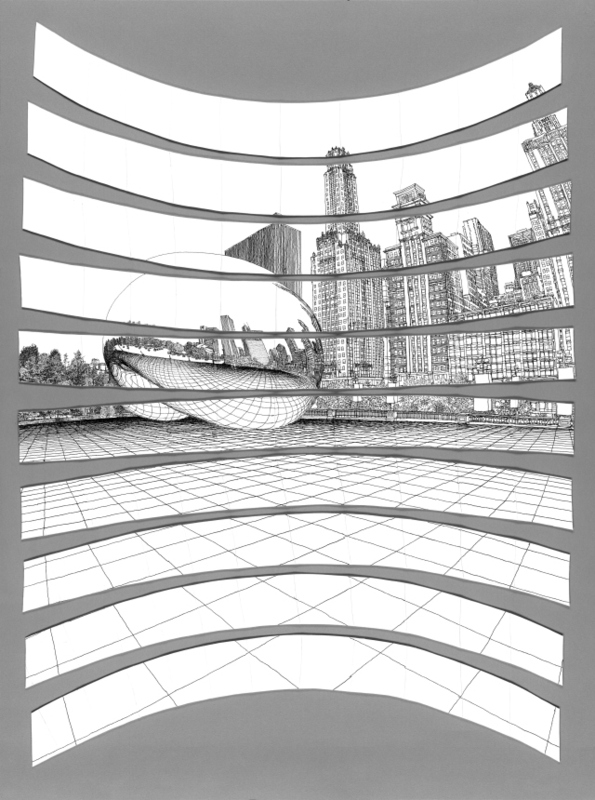 The artist appears to be able to see the scene through the paper and is able to guide the pencil tip over the real objects in the distance and render a scaled drawing onto the actual curved surface. One can only render the very edge of the paper, one margin at a time, because the area turning transparent can only be as wide as the distance between the two eyes (image 04). It is fairly easy to add or cut a slice of the rendering and reconstitute the whole image after all slices have been marked (image 05). The resulting drawings look continuous – “lifted from life” – thanks to the infinity of vanishing points that replicate the way rays of light propagate through space into one’s eye (image 01). Ryan and Trevor Oakes: close up of drawing in process, one section at a time. The sections have a width that corresponds to the distance between the two eyes (image 04). Ryan and Trevor Oakes: concave sections of the drawing laid flat (image 05). The system wasn’t of course conceptualized at once. What is striking is the brothers’ line of reasoning combining intuitive anticipations and analytic rigor throughout. The method was not intended and rather came out of an ongoing conversation about features of their vision, of their visual field and out of a genuine inclination of trying to understand how they perceive the world around them. It is very interesting to review their seemingly disparate realizations and how each step has gradually led to the conceptualization of the technique as it exists now. Every single doodle and mention that might have been considered benign by an individual became the terrain of exploration for the twins. They came to realize that we all see a profile image of our nose from the left and right eye at all times. 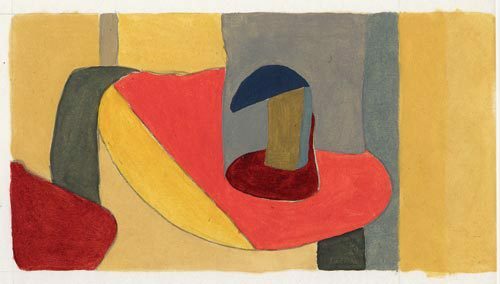 “So what?” Well, after repeatedly noticing shapes that could be an incarnation of their noses in the bottom left corner of their own abstract paintings (image 06) – and potentially in well known artists’ work such as Matisse or Rembrandt, they decided it was worth investigating. They continued drawing their respective left and right nose profiles. While one pointed a laser from his nose onto a sheet of paper, the other marked the laser points that outlined the nose to render the profile (image 07). They eventually deduced that both eyes can only see the world at once in the central zone (reinforcing the fact that, in their technique, the paper can only become transparent for an amount of space that is equal to the distance between our eyes) and that on either side of that zone you only have a monocular view of the world quite reduced by the protuberance of the nose. 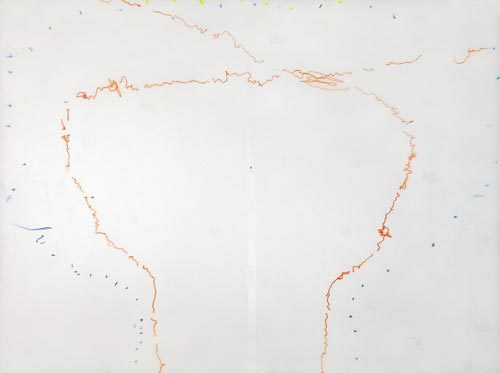 Ryan and Trevor Oakes: pencil marks of laser projected profile of the nose on paper (image 07). In addition to these perceptual conversations, they were simultaneously building – apparently unrelated – sculptures that would ultimately inform them about the nature of light and orient their thinking towards a more scientific arena. Trevor decided to work with matchsticks because of their inherent formal quality: one end is a small square and the other a larger circular tip. He was interested in how a form emerges from and relates to the modular component that it is generated by. He first stacked them in rows and obtained a square portion of a dome (image 08) that subsequently prompted him to work on a full hemisphere where the matches were stacked in rings (image 09). The brothers reflected upon the latter structure and found that one of the entities in nature that shares the same spatial properties (a bunch of rays perpendicular to a sphere) is dispersing light emitted from a point source. 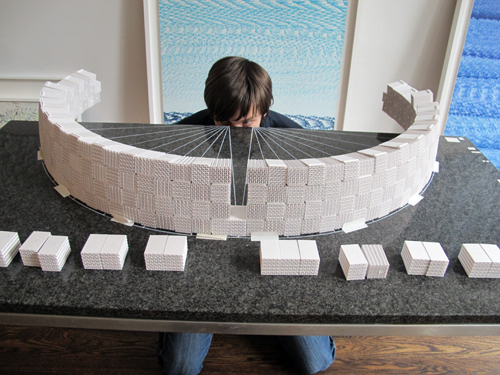 Ryan and Trevor Oakes: square portion of dome and hemisphere built out of matches (images 08/09). It reminded them of the spherical feature of our vision as opposed to the idea of a flat plane as if looking through a window. In order to demonstrate the concept, the brothers built a checkered structure made of corrugated cardboard modules like keystones that propagate a curvature horizontally, vertically and diagonally. As the viewers place their eyes at the center point of the installation, they can see through all the corrugation at the same time. It looks like the structure is disintegrating – consequently highlighting that we look at the world from the center point of a sphere (images 10/11). Another phenomenon that the twins identified and examined was the reflection of themselves and the entire gallery space behind them into 1/4-inch tacks that were holding drawings in an exhibition. It implied that a light ray from every point in the room was traveling to the locations of each tiny tack. The Oakes deduced that the behavior of light is more complex than one can actually see, with rays going in every single direction. 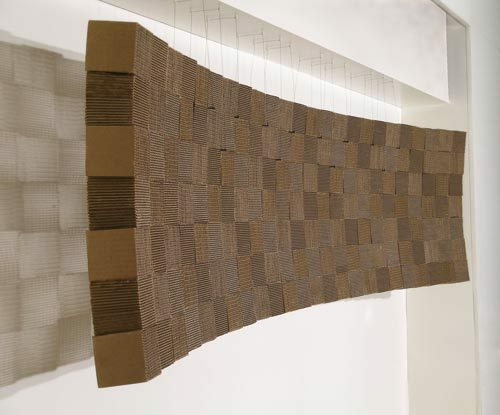 Ryan and Trevor Oakes: side view of structure made of corrugated cardboard modules (image 10). 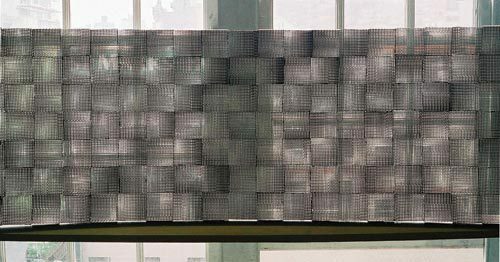 Ryan and Trevor Oakes: front view of structure made of corrugated cardboard modules, it becomes see-through (image 11). It might have been difficult for an investigator in visual phenomena to have come to such a creative solution as specialists are often attached to the technological dimension of the field they study. Certainly two of the reasons why Ryan and Trevor were able to link and interconnect their structures and experiences in a meaningful way were their general approach and the physicality of their research. Also their sense of wonder and continuing assessments are fundamental attributes of the success of their endeavors. As I could not stop thinking about the continuous quality of their spherical drawings and their relationship to the continuous and curved shapes of the Endless House project, I started researching the architect and artist Frederick Kiesler (image 12) who directed the Laboratory for Design Correlation within the Department of Architecture at Columbia University from 1937 to 1943. Though his ideas were visionary, he did not leave any significant designs or structures behind. Going through the catalog of “Co-Realities”, an exhibition of a selection of Kiesler’s drawings organized by the Drawing Center in Manhattan in 2008, I was reminded of two fantastic sketches where he attempted to represent the way we see, by stressing the simultaneity and transparency with which the perceiving subject sees through solid forms or through what appears to be layers of time and space  (image 13/14). He would have undoubtedly been thrilled by Ryan and Trevor’s discovery as they, in many ways, followed in his conceptual footsteps and working methods, and produced a concrete outcome. 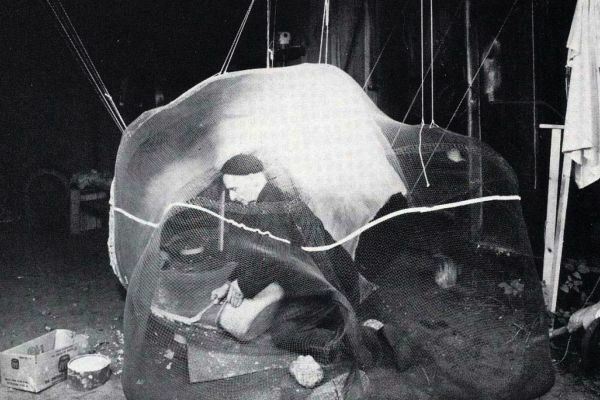 Fredrick Kiesler: Portrait of Frederick Kiesler at work (working on a model of the Endless House) 1965, Benjamin Zeller Memorial Fund (image 12). 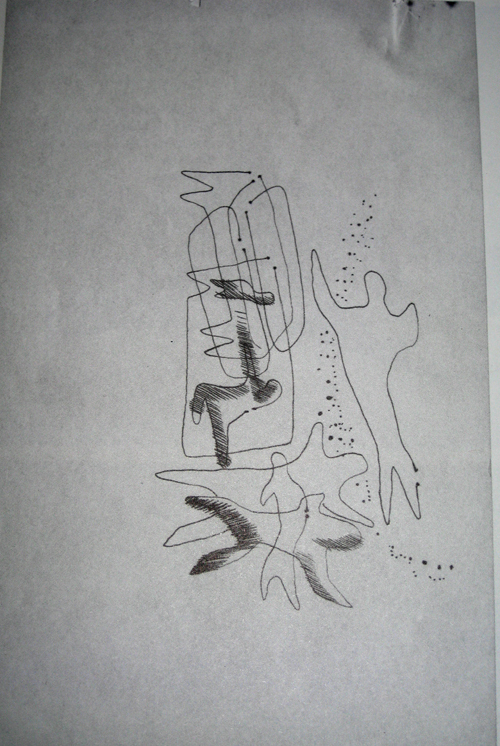 Frederick Kiesler: Study of human perception, 1937-41, ink on paper, 8.5 x 5.5 inches (image 13). Frederick Kiesler: Study of human perception, 1937-41, ink on paper, 9 3/8 x 6 inches (image 14). Frederick Kiesler claimed to have worked on only one project, “one basic idea” all his life: the Endless . He was looking for ways to express a sense of continuity between man, nature and technology and to raise awareness (image 15). He articulated all his ideas within one major concept that he named “correalism” – a complex and idiosyncratic system of thoughts around the notion of “correlation”, that is essentially any meaningful relationship between ideas, objects, persons, or spaces . For Kiesler “an object doesn’t live until it correlates” and the investigation of correlation is necessarily the task of artists who wish to reveal the ways humans relate to the world and each other . 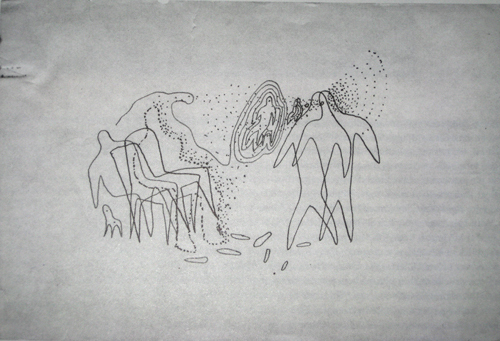 He implemented the techniques of experimentation and intuition of the Surrealists (whom he extensively collaborated with), as well as the examination of sensory perception and dreams in his multidisciplinary practice. In his laboratory, sketches and doodles obtained while letting the mind wander were used to solve problems of design, architecture or philosophy. 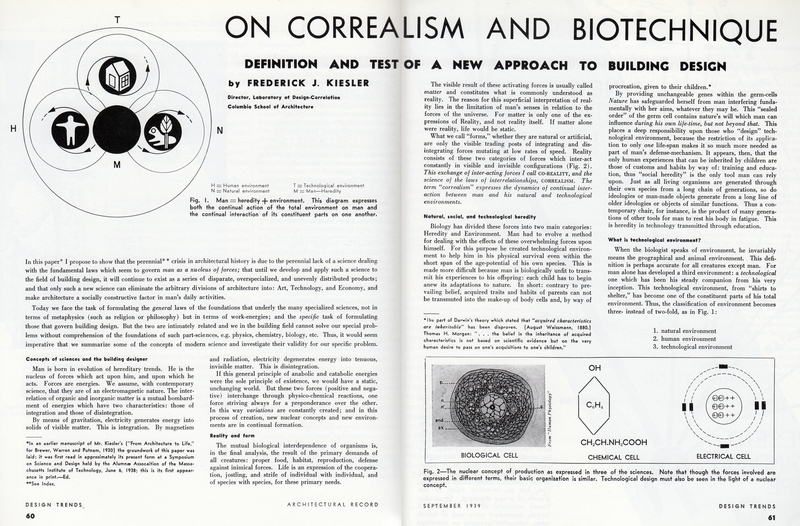 Frederick Kiesler: "On Correalism and Biotechnique. 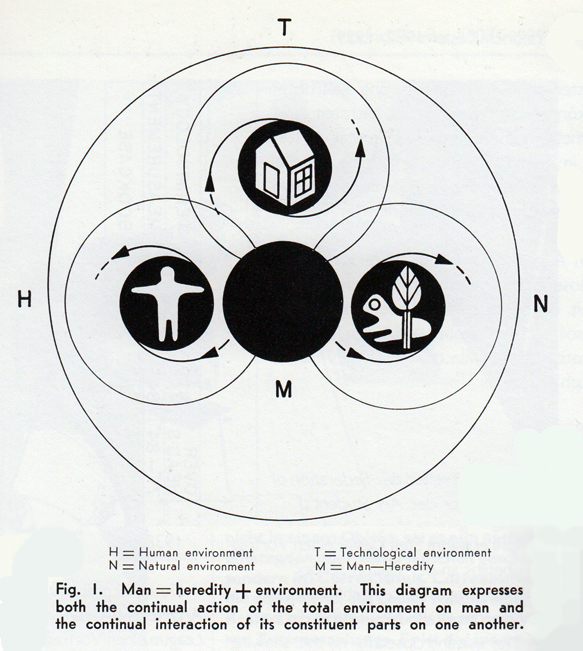 Definition and Test of a New Approach to Building Design", Architectural Record - Design Trends, September 1939 (image 15). The Oakes and I met on two occasions, once during their residency at the Curtis R.Priem Experimental Media and Performing Arts Center (EMPAC) in Troy and a second time in their new studio in Manhattan. In both instances, a corner of the room was dedicated to sketches and doodles, including a series of tiny sculptures made out of twirled colorful anodized aluminum wire inspired by String Theory. Ryan and Trevor’s inherent practice is composed of three major sequential steps: sketching and doodling to unleash the unconscious elements caught in the mind, reflecting on these improvisations to see what kind of structures they suggest, and ordering these elements into meaningful objects from which to build on. Last but not least, they do this all in reverse and start again, constantly moving back and forth, simultaneously completing pieces that inform one another. The dome shape has already played a major role in their rendering method but the brothers have yet to “correlate”, or in other words, find a significance of the various spiral shapes waiting in the studio, although they are already thinking it might lead them –years down the road – to design a “piece of architecture” or a “dwelling of some sort” that would “interface with rain and wind currents in an innovative way”. 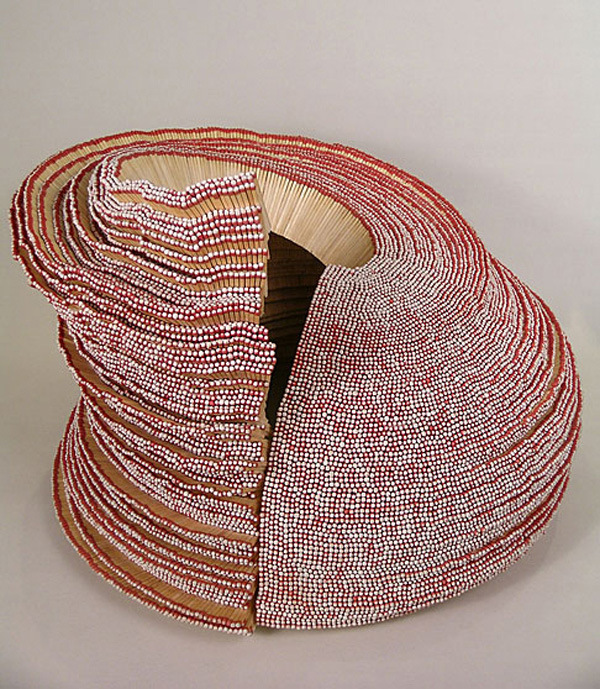 Ryan and Trevor Oakes: matchstick spiral (image 16). Ryan talks about synchronization rather than correlation. About his brother’s spiral structure: “If you took a block of clay and sculpted a spiral, you would probably not end up with that organic result. The shape here is a more complex form and you can grow it with these matchsticks in a way that is synchronized and somewhat elegant.” Ryan stresses the importance of the parameters that will determine a body of work and the significance of sticking to those parameters throughout the making of a piece. “The more you can hold yourself accountable to follow certain rules, you will find yourself in a territory that is much more elaborate than you would have somewhat consciously conceived of”. Ryan consistently chooses a strict set of rules in order to justify the creation of a work so that the piece will be synchronized in accordance with those rules. In his blue paintings (image 17), he defined four “differentials”: color (blue), value (adding white gradually), paper (medium grey) and a brush (made by himself). He simply rolls the brush, line after line, changing the pitch of the stick in relationship to the paper, thus creating traces with a scale shift. It starts parallel (with large traces) and ends up perpendicular (with smaller traces), and produces a full 90-degree angle (like in Trevor’s matchstick dome). Taking into consideration the fragility of the large pieces of paper he was drawing on, he thought it would be interesting to test the structure and work with the materiality of the paper itself. So the body of work that followed is a series of square pieces of blue and white paper that have been severely distressed to “unify them” (image 18). He applied forces to each piece as a means to “make every square centimeter on the surface related to every other square centimeter. It could continue to expand beyond the paper. It is more of a single thought than it is a series of thoughts. It’s not like a story line, thinking through a beginning, a middle and an end. It’s applied onto the surface and hopefully the whole thing is synchronized.” He named the series “Unified Fields”. 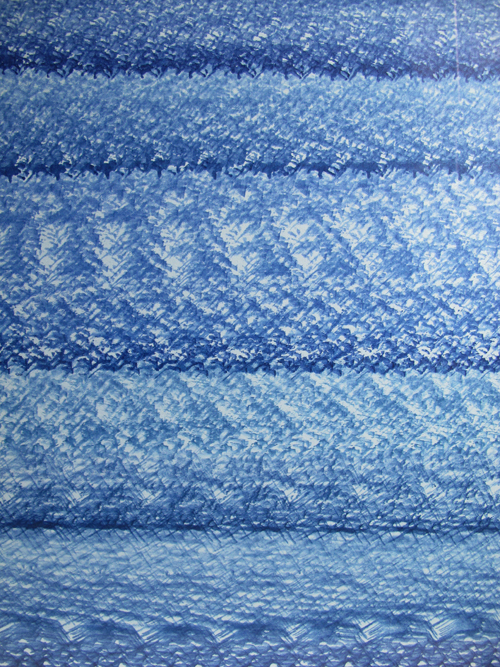 Ryan and Trevor Oakes: Ocean Texture 2, 2010, painting on paper, shellac ink, vinyl acrylic, 42.5 x 34 inches (image 17). 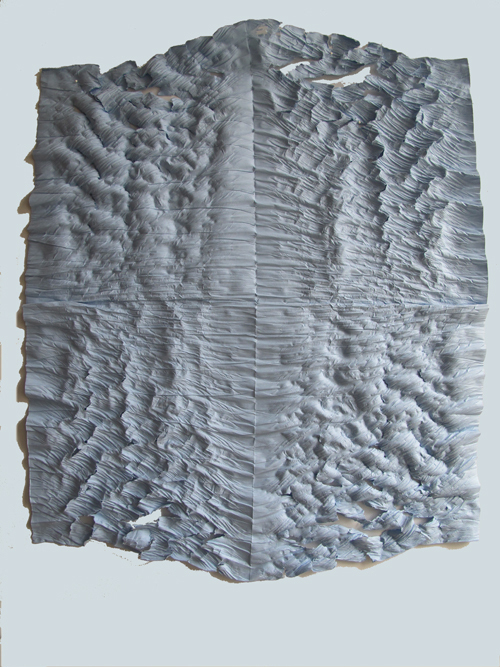 Ryan and Trevor Oakes: Unified Field (expanding), 2011, cotton paper, 39 x 32 inches (image 18). Ryan and trevor Oakes: pipe cleaner 1 (image 19). 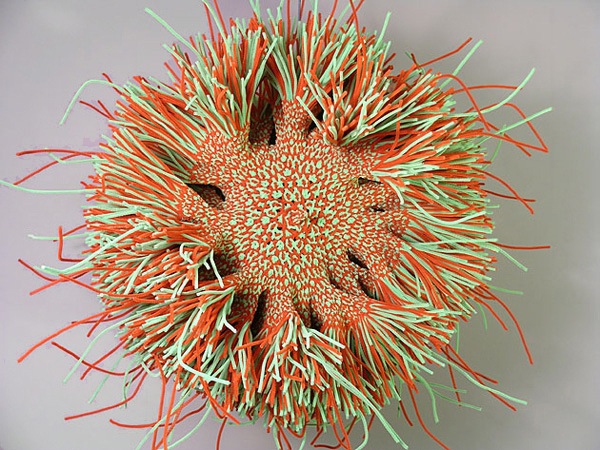 Trevor is very intuitive and leads the pair’s spatial and three-dimensional thinking (in another body of work, Trevor made some pipe cleaner weavings that, although he didn’t realize it when he was making them, follow the principles of hyperbolic geometry) (image 19). Ryan is rational and deductive and is able to unify their thoughts: “Even if I am executing the body of work or Trevor is executing the body of work, our dialog is informing the direction.” Talking about the perspective work: “Here the apparent arbitrariness (of marking the surface) is in fact justified, because it is derived directly from this mental cognition of sight. Even though it is a traditional pen making marks via a hand via a brain that is telling the hand where to go, it’s taking its cues directly from sight, which is to say directly from the brain calculating the electric signals that come into the retina.” Ryan and Trevor Oakes’ technique reminds us of the physicality of seeing and tells us that in the three-dimensional space in front of us only one point can be perfectly aligned in the visual cortex with everything else progressively splitting into a double image. So in fact, the illusion we have of a clear world is obtained by our eyes darting to and fro at single focused points, producing a synthetic image of an overall clarity. Ryan and Trevor Oakes: "seeing with two eyes" photo by Eve Bailey (image 20). Seminal Notions: The Idea and Practice of Perspective, at the Chicago Humanities Festival, with Jonathan Crary, Ryan and Trevor Oakes, moderated by Lawrence Weschler.